Packaging is an important medium for reducing preservatives used in food, minimizing food waste and preserving food quality. The main goal is to protect the food from physical damage and chemicals as well from leaking and spilling. With about 30,000 people employed in the packaging industry, the Australian market is considered a very small one with an estimated value of $AUD10-10.5 billion. However, a lot of things have changed since the first packaging was made. Plastic was the most common material used. Today, thanks to the technology innovations, there are a lot more options to choose from, including eco-friendly food packagings. When choosing food packaging for your business, make sure you choose a material that minimizes waste. In other words, pick either biodegradable, compostable, or recyclable packaging. Now let’s take a look at their different features and help you out pick the most suitable one for your business. – Biodegradable materials can be broken down and completely become one with nature thanks to the fungi, bacteria and other microorganisms found in the environment. This is a process that can happen through either aerobic (with oxygen) or anaerobic (without oxygen) degradation and it can last from one to thousand years or more. Unlike other sustainable products, biodegradable materials are not required to meet any specific regulations and standards. The production process creates far less pollution and since biodegradable products break down into nontoxic components, they do not poison water nor pollute the air. – Compostable packing is similar to biodegradable materials but still, there are some differences. 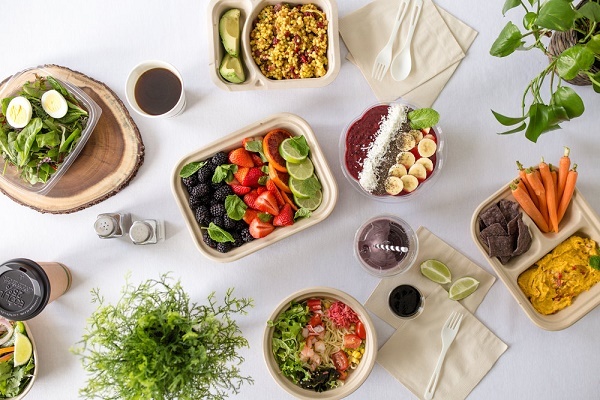 Compostable products, if disposed of properly, can provide the soil with some valuable nutrients without releasing toxins – which is one of the major benefits of these products. Depending on the conditions, it takes about 3-6 months for a biodegradable product to break down. On the other hand, compostable packing takes less time to degrade. The process usually takes about 180 days in the right conditions, but this is rarely a case. For this reason, compostable products should be disposed of at specific industrial facilities that use heat to break them down. – Recyclable food packaging can be remanufactured again into a new product, which makes it the most eco-friendly option there is. Before that, the end user has to want to recycle the product and if they do – the recycle center (if there’s any in that area) needs to be capable of recycling that particular material. Mind you – the product must not contain any food contamination.